We only have 70 days to go till we go back to the good ol' U.S. of A and each day seems to drag by so slowly. It reminds me of my childhood just weeks before Christmas, the wait was unbearable. Speaking of Christmas, we are really looking forward to being home in time for Christmas and being with our family and friends. My Dad is also very excited to see our kids again. 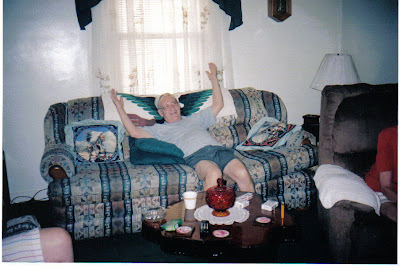 Below is a picture of Dad in a carefree and happy-go-lucky mood. Here is a pic of the women in our family. 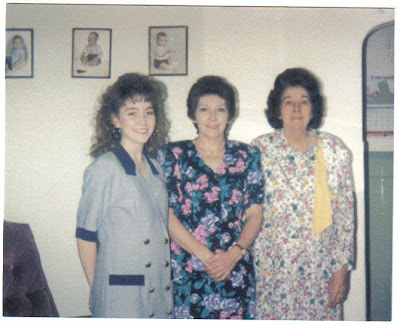 My niece Jen, my sister Crystal (Jen's mom) and my mom a few years before she passed away. This picture was taken when Crystal won "Mom of the Year" in our region. She got a limo ride to dinner and all of the special treatment that goes with it. Jen submitted an entry and that entry won. My mom joined them for the celebration. beautiful memories behind old photos! sure, "home is where your heart is!" Right, photos really brings happy and sad but mostly happy memories. hello... just wanted to say that i think it's great that a navy man isn't all that tough after all. haha. u have a cute family... hope u'll be happy always :P i'll be peeping by your blog from time to time if u don't mind. haha. old pictures bring back memories :-), thanks for sharing, rose :-)! No place like home during the holidays. Old photographs are so fun to look at even when they're not mine. :) Thanks for visiting my blog and posting a comment. you are surrounded by beautiful women mr!! u are very lucky!! i love to see ur papa's smile!! :) he looks so happy.. Mom of the Year - how wonderful. I hope Grandpa gets to see the kids on christmas. Hi there! Only a few more days to go and then you'll be back in the States! YAY! I bet you are excited, it looks like you have enjoyed your stay where you are, I like your family pictures and also all the photos you have shown on your blog. Thank you for coning by, have a great week, which seems to be going fast. I love the picture of your Dad. CareFree! thank your for the visit! i added you in my links already and i've followed you as well. could you do the same for me? thanks again! was here, visiting, Joops :-)! Wow, I bet you can't wait til you come back here. Same as Grandpa is getting so excited..I love living here in the US.. We lived in Korea for almost 2 years, and I felt so stranger there especially when it's time for me to go to the market..Can't speak to Koreans at all..Hehehe! Great photo of the women in your family.. Have a great day.. By the way, I voted for Rylie today, and hopefully, I will remember tomorrow. Please remind me..